Lady and the Blog, review "Do You Have A Daughter In The Girl Scouts? Get Her A Girl Scouts Doll!" These are officially licensed Girl Scout dolls. These were sold through Adora and at Girl Scout Council shops throughout the country (as well as on-line), though they were discontinued and put on clearance in 2014. 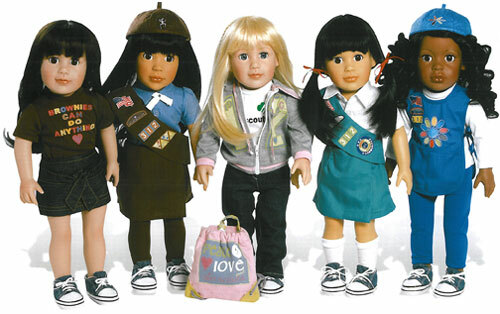 These are the same dolls as the Adora (4-Ever) Friends, but dressed in Girl Scout uniforms with separate sporty outfits available. Many (all?) of the separate outfits are versions of girl-size outfits Girl Scouts have sold and the quality is quite high (with the exception of the shoes which are very basic). The five dolls shown above are the 2011 - 2013 versions of the dolls: Abigail (white with dark hair), Ava (Latina), Chloe (white with blond hair), Lily (Asian), and Madison (African American). (These are the same as the Adora 4-Ever Friends, though that line also had Emily, another white brunette.) Each of the dolls was available in Daisy, Brownie, and Junior uniforms for a total of 15 dressed dolls. There were three t-shirt/skirt outfits (again, Daisy, Brownie, and Junior) and one trendy jeans/hoodie outfit with the GS service mark. Starting in 2013, the dolls names/face/body type was updated to match the revised Adora Friends dolls, and several additional sporty outfits were added to the line.